This puller is typically used with an extruder or other machine that produces plastic layered tubes or solids in various diameters. This machine automatically adjusts base diameter, profile changes and tapers. Extruded plastic tube can be precisely sized by varying pull speed and extrusion die air pressure. After the profile is formed, it is measured and the speed and pressure automatically adjusted as needed. Good product is then cut to a selected length with the cut located with respect to the profile and again to start the next length. The belt pinch drive is set to either a programmed speed or to respond to an input from an upstream measuring sensor. 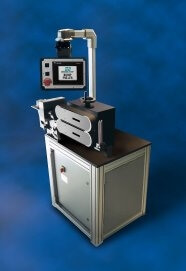 The touch screen is used to enter the desired profile and cut parameters. The sensor control is independently set to provide the proper control signal. The multiple outputs to the extruder can be programmed to jump to various preset pressures as set at the extruder. This puller combines automatic bump and taper forming with cut-to-length features in a safe system that is easy to set up and adjust. Rejected product is minimized as the process is more-precisely controlled.